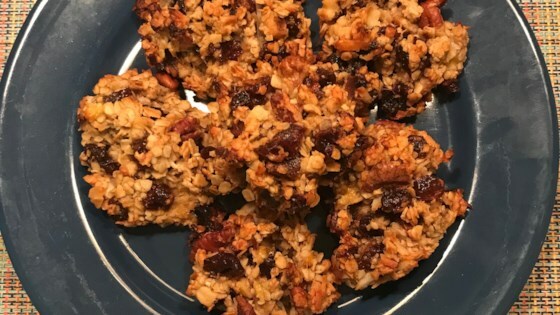 "My husband's grandma, Shirley, came up with this recipe so his brother (who was vegan) could enjoy Christmas cookies with the rest of us. Modified a little bit, we have been eating these cookies for years and we aren't even vegan!" Combine bananas, oats, dates, oil, walnuts, pecans, coconut, vanilla extract, and salt in a bowl and mix well. Spoon out cookies onto an ungreased baking sheet. Bake in the preheated oven until edges are golden, 20 to 25 minutes.